“The Madras Law Journal, continuously in print since 1891, is undoubtedly the oldest law journal in India and its reputation has deservedly travelled beyond our frontiers. 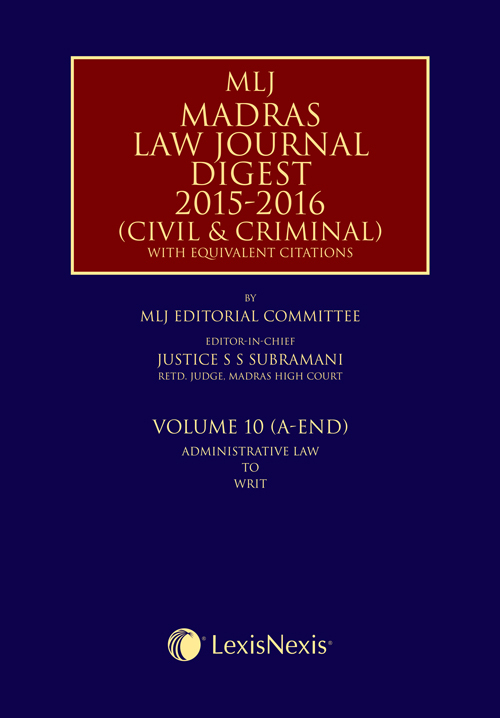 The Madras Law Journal Digest (Civil & Criminal) is a comprehensive digest of judgments of the Supreme Court of India and the Madras High Court, reported in 8 volumes of the Madras Law Journal (Civil), and in 4 volumes of the Madras Law Journal (Criminal), for the years 2015 – 2016. The digest consists of the complete headnotes including short notes, long notes and the rationes decidendi of the judgments reported in MLJ Civil from August 2015 to August 2016, and MLJ Criminal from October 2015 to September 2016.